I had all kinds of thoughts I wanted to write. On how Andrew Wyeth had been such an important figure to me in Art. And in many ways, Life. I wanted to pull quotes out of the many books I have lying around in every room of the house to better illustrate what was behind his work and why it's had such a profound and personal effect on me. Instead, I grew restless, so I rushed out of the house to find something to paint in my own neighborhood. Because that's what he did his entire life and will continue to do so through the eyes of all those who learned to see their own worlds the way he might have seen his. 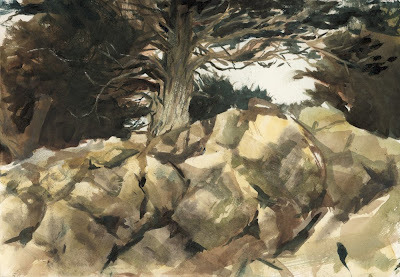 "For Wyeth - Berkeley Marina Cypress" Watercolor 7"x9"
Man, I did not know that he passed today. Thanks for bringing that to our attention, Mike. I remember the hoopla that surrounded his Helga paintings and was thrilled to see them when they made there way to the Detroit Institute of Arts. They were beautiful and mysterious and I couldn't believe how the man painted this woman for over 30 years without anyone knowing. I recall it raising some mixed emotions that were quite new for me at the time some 20 years ago. Gorgeous observation. Good work, mate.